The Diocese of Jerusalem is based at St George’s Cathedral in East Jerusalem. 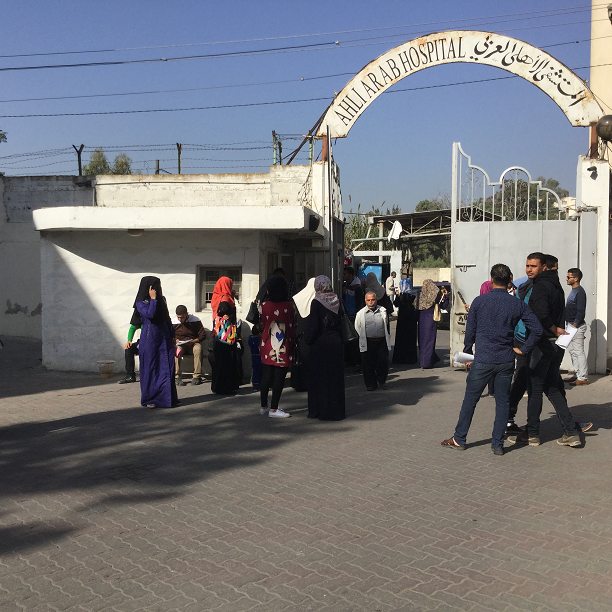 Anglican Overseas Aid’s main project with the Diocese is based at Al Ahli Arab Hospital in Gaza. There has been a permanent Anglican presence in Jerusalem since 1841. Since that time and through many changes, the Episcopal Diocese of Jerusalem now covers five countries (Israel, Palestine, Syria, Lebanon and Jordan) and is home to almost 30 parishes. Along with attending to the spiritual and religious needs of its people, the Diocese of Jerusalem has taken an active involvement in meeting the needs of marginalised people in this contested part of the world, including a strong investment in healthcare and education across the five countries. What does the Diocese of Jerusalem do? The Diocese of Jerusalem runs many healthcare and education projects and services across its five countries, including hospitals, clinics, rehabilitation centres, and schools. The Diocese has more than 30 institutions, employs about 1,500 people, has about 6,400 students in its schools and about 200 beds in its hospitals. Alongside this work, the Diocesan Peace and Reconciliation department continues to strengthen interfaith dialogue between Christians, Jews and Muslims, and the Kids4Peace program strives to educate the next generation in a language of tolerance and acceptance. Anglican Overseas Aid has partnered with the Diocese of Jerusalem since 1988, including providing support for health care through Al Ahli Arab Hospital in Gaza, and St Luke’s Hospital and the Penman Clinic in the West Bank. St Luke’s has been operated by the Episcopal Diocese of Jerusalem since 1984. The hospital aims to provide the local community of Nablus and surrounding area of the northern West Bank with vital quality healthcare services: general medical and surgical inpatient and outpatient services, as well as obstetric, neonatal, and pediatric care. The Penman Clinic, in the small Christian village of Zababdeh near Jenin in the northern West Bank, was established in 1994 in memory of the late Archbishop of Melbourne, David Penman, and is managed by St Luke’s Hospital. The clinic, which is about two hours north of Jerusalem, provides health care for the poor and needy patients inhabiting Zababdeh village and 12 surrounding villages. Anglican Overseas Aid no longer provides support for St Luke’s Hospital or the Penman Clinic, but these are proud parts of our historical relationship with the Diocese of Jerusalem. Our partnership with Al Ahli Arab Hospital in Gaza began in 1988. This Anglican hospital, run by the Episcopal Diocese of Jerusalem, offers health care to 32,000 outpatients and 2,100 inpatients each year, regardless of ethnicity, religion, political affiliation or economic status. Al Ahli Arab Hospital established the Women’s Health, Women’s Rights project in 2009, after female community leaders campaigned for action on the suffering that women were experiencing due to breast cancer. Through this project we aim to improve the survival rate of women with breast cancer through earlier detection, appropriate treatment referrals, and advocacy for improved access to medical treatment outside Gaza. An important aspect of this work is addressing stigma related to breast cancer, through a program for male community leaders and men with family members with breast cancer. Funding: The Women’s Health, Women’s Rights project is funded by grants from the Australian Government’s aid program and donations from the Australian public.